After seeing the first trippy trailer for Silent Hill: Revelation 3D, I'm not sure what to think about this sequel to the original video game adaptation. It just feels like an acid trip gone horribly wrong, and the 3D just feels like a theme park gimmick (ironically enough, Silent Hill is getting its own theme park attraction at Universal Studios). Now this new poster doesn't do much to sway that opinion as it looks like an advertisement for a 3D video game sequel rather than the film itself. There aren't even any cast members on it to try and sell the flick. Of course, I think people who are already sold on the movie don't care either way. For years, Heather Mason (Adelaide Clemens) and her father have been on the run, always one step ahead of dangerous forces that she doesn’t fully understand. Now on the eve of her 18th birthday, plagued by terrifying nightmares and the disappearance of her father, Heather discovers she's not who she thinks she is. The revelation leads her deeper into a demonic world that threatens to trap her in Silent Hill forever. 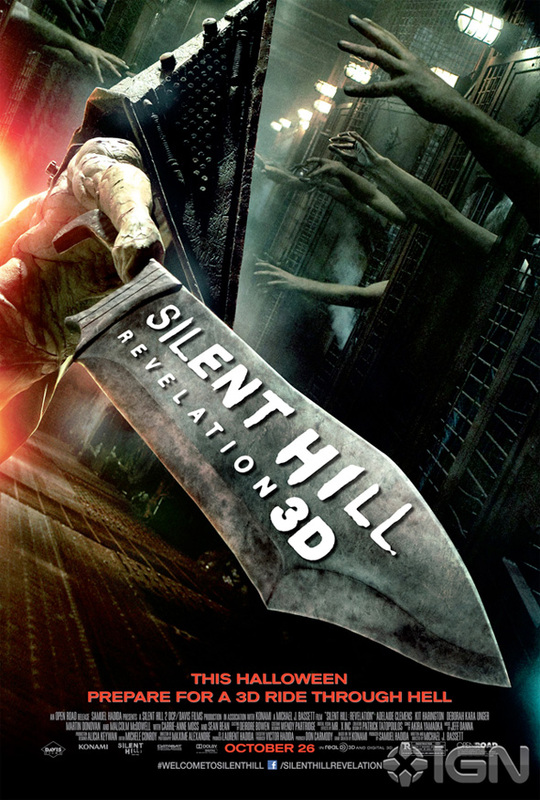 J. Michael Bassett (of Solomon Kane) wrote and is directing Silent Hill: Revelation 3D which also stars Sean Bean, Radha Mitchell, Carrie-Anne Moss and more. The film arrives near Halloween on October 26th. Still can not believe I saw the first film twice in theaters. Oh the deluded mind of a young fanboy.